New York airport transportation - to and from JFK, LaGuardia and Newark. How do you get the smoothest from the airport into Manhattan and then back to the airport for the flight home? There are some different ways to get from the airport you arrive at and into New York. Some expensive ways and some less expensive. All the times we've been to New York, we have booked us on a so called sharde shuttle with either GO Airlink and SuperShuttle (the 2 biggest shared van companies in New York. A shuttle is a van that will take about 10-12 people. You pay a fixed sum per person and then jump into the car with others who just arrived with their flight from around the world. Your luggage will be stowed in the back. NOTE As with all airports, DO NOT go with people who come up to you inside the terminal and offer you transport to New York. If you have not booked your shuttle before you left home go to Ground transportation information to inquire about transportation. If you want to get a cheap ride to your hotel in New York from any of the airports we would like to suggest a shared shuttle. We use this airport transfers when we go to New York. A shuttle is a van that takes about 10-12 people. You share the van with others who have arrived and you are driven to your booked hotel or apartment, a so called door-to-door service. Very convenient and affordable airport transfer alternative. Shuttles runs around the clock every day of the year. Super good! 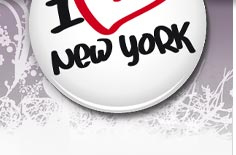 You can go from the airports, JFK, La Guradia (LGA) and Newark (EWR). The ride takes different time time into Manhattan, depending on the number of stops and from which airport you go. Return: Of course, you can book the shuttle when you shall back to the airport for the return flight. Either book return directly or single journeys separately. Private car: You can also use GO Airlink to book a private car to pick you up at the airport if you do not want to share transportation with others. The cars take up to 3 people, or up to 6 people. The price is per car. If you are many travelling together, you can even book an entire van for up to 11 people. Newark (EWR) airport is located in New Jersey and opened in 1928. It is New Jersey's largest airport, about 20 km outside of New York. 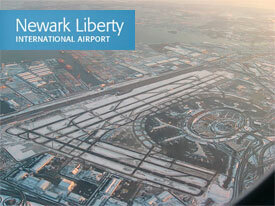 You will arrive in Newark if you, for example, fly with SAS, Air France, British Airways, Iceland Express and others. You can get from Newark with different transportation. NJ Transit: One way is to get on the train (AirTrain Newark), which binds everything together at the airport and take you to the NJ Transit train station which then take you into Penn Station on Manhattan. When you have arrived at Penn Station, you take the local transportation to your hotel like the subway, bus och taxi. Newark Airport Express: Bus to Manhattan. The bus departs from Terminal A, B and C. The bus takes you to three different bus stops in New York. Grand Central Station, Bryant Park and the Port Authority Bus Terminal. The airport JFK is located in Queens about 24 km outside of New York and opened in 1948. It is New York's main international airport. 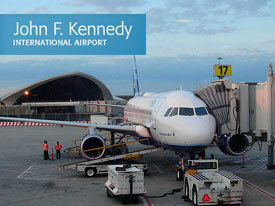 The airport was named John F. Kennedy International Airport on 23 December 1963, after the former president. You will arrive in JFK if you, for example, fly with British Airways, Air Berlin, Air France, Brussels Airline, Delta, Finnair, KLM and others. You can get from JFK with different transportation. Subway: You can get on the train AirTrain JFK to take you both around the airport but also to the subway stations Jamaica or Howard Beach. Depending on the subway station you choose, you get in to Manhattan's various stations on either Lower Manhattan or Midtown Manhattan. If you get to Jamaica station, you can also take New York's commuter the so called LIRR - Long Island Railroad which takes you into Penn Station. 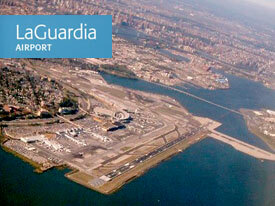 LaGuardia (LGA) is the airport located nearest New York about 13 km from Manhattan. As JFK LaGurdia is also located in Queens. It's not likely you arrive here as this is mostly a domestic airport. But if you're flying to New York from other parts of the U.S., you can also arrive here. From here you can also fly to the Caribbean islands of Aruba, the Bahamas and Bermuda. The airport opened in 1939 and is named after the late New York Mayor Fiorello LaGuardia (1934-1945). You can get from LaGuardia with different transportation. Please see below for other options to get from New York's airports into your hotel in Manhattan. Actually, it's probably just the wallet that determines whether you want to go in your own limousine or taxi or in a shared shuttle. Here you will also find SuperShuttle (blue van: the one with the big white wings). You can use this if you have booked a private apartment and not a hotel. Do you have a hotel the cheapest option is GO Airlink.